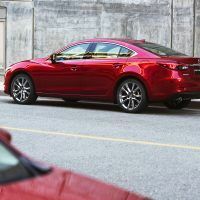 The Mazda6 Grand Touring isn’t perfect, but it might be the sportiest midsize sedan on the market. 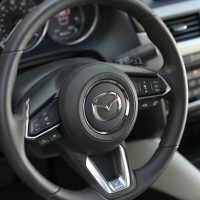 If you like to drive, Mazda knows how to entertain your passion for taking the curves a bit faster than the average commuter. This sedan also looks the part on the outside. Mazda designers cranked up their styling juices and have given the car a good dose of sleek. This vehicle is not all show either – it will also go! 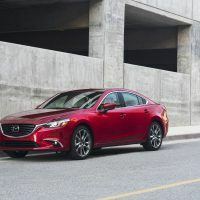 The Mazda6 gets some minor updates for 2017, including the now standard Mazda Connect infotainment system. It also gets G-Vectoring Control: computer-controlled braking of the individual wheels through corners, bringing increased stability and improved handling. The 2017 Mazda6 Grand Touring ($30,695) comes with 19-inch wheels, automatic wipers, advanced keyless entry, blind-spot monitoring with rear cross-traffic alert, forward collision mitigation, and dual-zone automatic climate control. The top-of-the-line Grand Touring also features LED foglights, automatic high beams, a rear trunklid spoiler, steering-wheel-mounted paddles shifters, a traffic sign reader with speed warnings, heads-up display, universal garage door opener, navigation, leather upholstery, and an eight-way power driver’s seat with memory functions (six-way power front passenger seat). 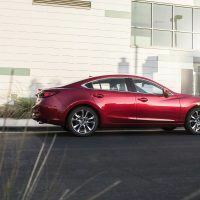 The optional GT Premium package ($2,500) added Mazda’s i-Eloop brake regeneration system that increases fuel efficiency. 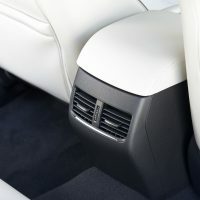 Also included were active grille shutters, heated rear seats, a heated steering wheel, premium Nappa leather sport seats, interior ambient lighting, a black headliner, and unique interior trim elements. Total MSRP including destination: $34,695. 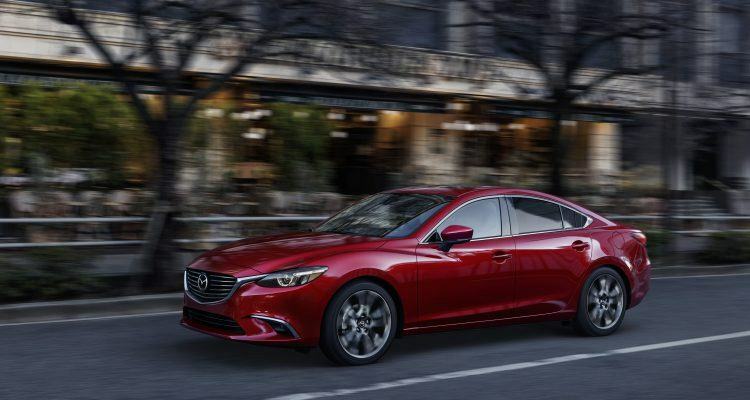 The material quality is high and the styling inside the Mazda6 is first rate. 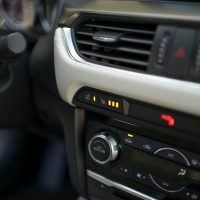 We had a black with white interior trim on our tester which is our favorite cabin look. Stepping inside you’ll notice a sweeping dash crowned by a bright new seven-inch infotainment display screen. 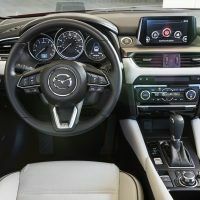 The Mazda Connect infotainment system is quick enough, but the control device is somewhat uncooperative and the mapping isn’t as good as some rivals. The sport seats offer excellent support for spirited driving, and the Nappa leather on the Grand Touring gives the sedan a luxurious feel. We enjoyed the heated steering wheel and seats as a cold snap hit the front range of the Rocky Mountains near Denver this week. There’s impressive interior space up front, and there’s good leg and knee room in the rear, even for taller adults. The sporty styling does cut down on rear passenger headroom with the raked roofline, however. 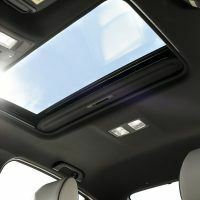 The cabin is quiet on the road at highway speeds, and visibility is improved with the use of high-strength steel in the roof pillars, allowing them to be a bit narrower. 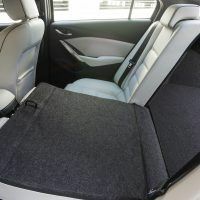 The split rear seats fold forward for additional cargo room, and the trunk offers 14.8 cubic feet of space with a wide load opening. 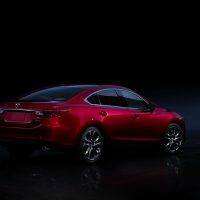 The 2017 Mazda6 comes with one engine, a 2.5-liter inline four-cylinder with SkyActiv technology. With direct injection, variable valve control, and a 14:1 compression ratio (in pursuit of fuel mileage), it produces 184 horsepower and 185 lb-ft. of torque. 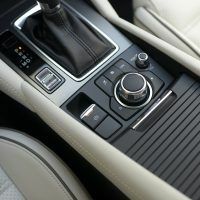 We had the optional 6-speed sport mode automatic transmission. 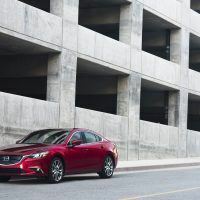 The Mazda6 with an automatic gets an EPA estimated 27/35 city/highway and 30 combined mpg. We averaged an impressive 31.2 mpg for the week at altitude. 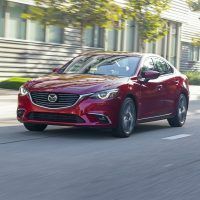 True to Mazda vehicles being known for their good balance and handling, the Mazda6 maintains that standard, and even ups the game a few notches on the fun-to-drive meter. We are probably being picky when it comes to power, but we felt the 2.5-liter engine could use a bit more. 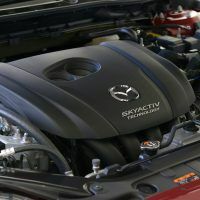 We understand Mazda is trying to keep fuel mileage up and they succeeded in that department. Overall, the 2.5-liter four-cylinder engine is smooth and it’s a joy to drive with the 6-speed automatic and steering wheel paddle shifters. This engine likes to rev and the paddle shifters give you the ability to get the most from this engine. 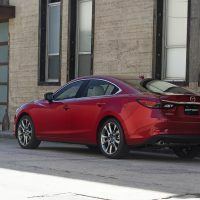 The Mazda6 came alive on the curvy roads we tested it on near Evergreen, Colorado. 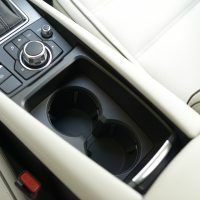 The steering felt solid and communicative, the ride was firm and planted with the 19-inch wheels on the Grand Touring trim. 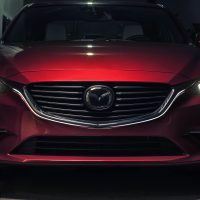 If you are looking for a plush sedan ride, the Mazda6 is probably not for you. If you like to drive, it’s the best in this segment. 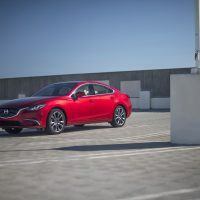 With the new G-Vectoring Control, the Mazda6 now applies braking to separate front wheels in the corners, shifting weight forward and increasing grip so the turn-in is more secure. When it releases, weight shifts to the rear for improved balance. The 2017 Mazda6 Grand Touring looks good and it feels even better when you get behind the wheel. 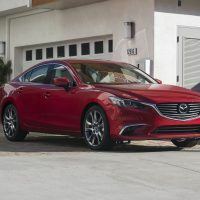 The sedan handles exceptionally well, the ride is firm and sporty, and the response from the steering and automatic transmission is what driving enthusiasts will enjoy on the commute. 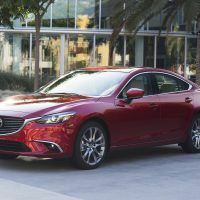 The 2017 Mazda6 is a competent, comfortable, and enjoyable midsize sedan. 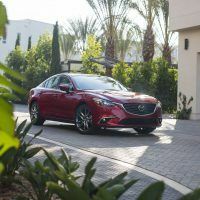 No Comments on "2017 Mazda6 Grand Touring Review"